Christmas, one normally assumes a time of goodwill and charity. We read and absorb selected stories because they are ones that remind us of our need to give to others. At this time charities take advantage of the spirit of goodwill of this time, to promote their work amongst the community, and gather the bounty of “grain into the barn” sufficient to last them through the dry seasons that follow this outpouring of generosity. People are also distracted with matters of family, consumerism, charity, religious observances, friends, barbecues, children, school year completions, holidays and – in areas that aren’t in the retail industry – a slowing down for office workers. Parliament closes down for the year, and so one assumes that political machinations take a break. It is also assumed, of course, that no one is listening to them at this time of the year. However, what is recognized as a lull in proceedings (where everyone is preoccupied), it would appear that the LNP party has been surprisingly active. Those who have not taken their eye from the Liberal party’s agenda were surprised to discover activity in the making. The liberal party’s ideals of charity and goodwill for Christmas appear to have taken a turn towards making decisions that continue to act against our collective good as a nation and as a people. Perhaps, they thought we weren’t looking, and many of us were not! Tourism in Australia is eclipsing mining as a revenue source for our economy. 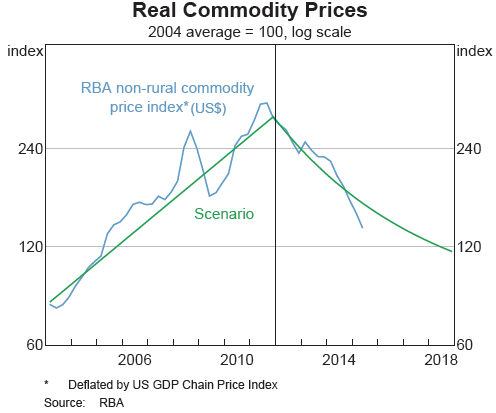 As real commodity prices continue to drop – as they have since 2011 – and expectations in an international environment committed to a reduction in coal usage; hope for a return to commodity price booms are diminishing year by year. As the mining industry continues to employ now less than 2% of the workforce, and a diminishing return to the GDP. (Actually, mining contributed nothing/zero/zip/nada to economic growth in the last December 2014 quarter – dropping from 5.6% in 6 months.) It would appear to be an unusual and short-sighted resolution to approve a massive expansion of the Abbott Point coal terminal. Given that such a conclusion will result in the mass destruction of our coral reefs, which form one of the major attractions (that being tourism) in this region, how does trashing tourism and favouring mining make for an economically sustainable decision? The ENVIRONMENT minister, Greg Hunt’s Christmas time decision, to approve the expansion as mentioned above – which will involve dredging 1.1 million cubic meters of spoil near the Great Barrier Reef Marine Park. This surely will be questioned as environmentally irresponsible in the courts as previous attempts to progress this mine have been. Peter Dutton appears to have followed similar levels of compassion as did the former Minister for Immigration, Morrison’s charitable inclinations. The flip-flopping over the decision to deny a terminally ill Pakistani man (Hassan Asif) to see his family, and this he suddenly reversed AFTER holding a press conference defending his decision to deny the visa. It is notable that his first instinct was to deny access to this dying man’s family. Hassan was NOT a refugee or an asylum seeker or someone who came here by boat. Aside from having flown here legitimately, he was a student studying in Melbourne, who discovered that he had terminal cancer. Oddly (to Dutton’s perceptions), his parents wanted to be with their son as he died. Unfortunately, as no commercial airline would fly him home in his condition, the only option available was for his family to fly to him. Christmas charity, or any charity for that matter, was certainly not foremost on Mr Dutton’s mind. But this is consistent with the nature of the compassion exhibited by all Ministers for Immigration produced by the Liberal Party to date. Christmas was also the time that the productivity commission report into workplace relations was released. 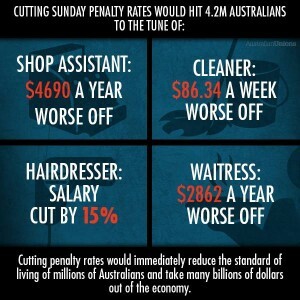 Amongst its recommendations, the slashing of penalty rates for Sundays confirmed the inclination to revoke these rights that have been a long running preoccupation of the Liberal party to worker’s rights in Australia. Workplace relations minister, Michaelia Cash, has particularly avoided addressing the issue with the press and criticised Labor and the unions for “scaremongering”. Despite attempts to relegate the report to an arena of objective non-governmental decision-making, it is – to date – surprisingly aligned with the conversations about revoking penalty by members of the Liberal party. In a country of high unemployment where the unemployed outnumber the jobs available in the country by a very wide margin, the proposal that the savings would allow businesses to hire more people has numerous inherent fallacies socio-economically and mathematically. 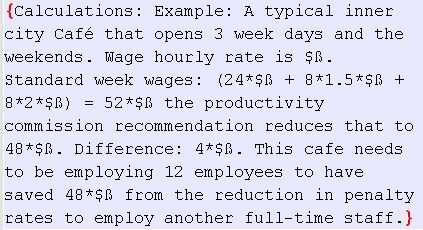 Example calculation of the mathematical Savings in Penalty rate changes. The majority of Australian workplaces (85.1% of all businesses) are micro businesses (i.e. less than five employees). The savings from penalty reductions would not be enough to fund the employment of additional staff. Under the current proposal, a business would save itself a quarter of the hourly rate on a Sunday (Double time on Sunday reduced to 1.5 times hourly rate – according to the productivity commission report). By my calculations, a business would need to be employing at least a dozen employees (depending on the mix of days any given staff may be employed in a business), so that penalty rate reductions could fund an additional full-time employee. 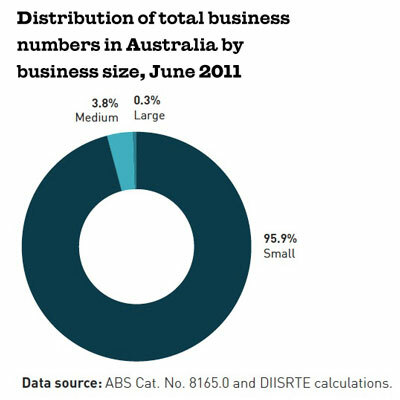 Small businesses that employ 5 to 19 people represent 10.8% of Australian Businesses. The argument that this is beneficial simultaneously for micro to small businesses and employment rates is simply not true for the vast majority of Australian workplaces. That is 95.9% of businesses for those who haven’t yet done the math. It is only the larger industries (0.3% of businesses) and medium sized industries (3.8% of businesses) which employ more than 20 people in their enterprise that may find significant enough savings to afford to make a change to unemployment in this country – always providing they were so willing. When employment in larger industries is diminishing (such as mining, manufacturing & construction), consumer confidence is low, retail sales data shows diminishing returns, and wage growth is already sadly small, why exactly would large. Where is the economic stimulus being directed? There is, in fact, little evidence that changing penalty rates will do anything to change employment rates. 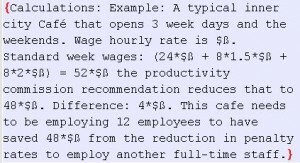 If you diminish the wages available to employees in small businesses, less money will be expended in the economy by these employees, as they reduce discretionary spending to pay more “essential” bills. 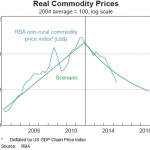 There is an argument that in fact, such steps will only push us further into recession. We have only avoided an official classification of a recession in the last term of 2015 because of the national accounting practices in relation to recording defence spending, not because, we have had any real growth in the economy. 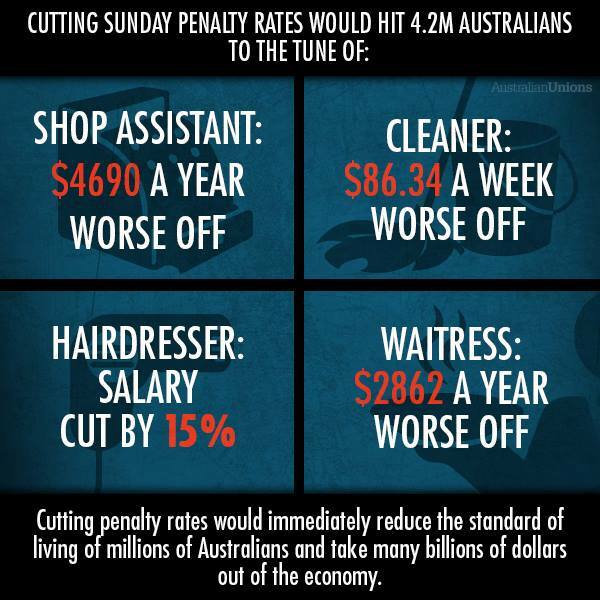 Essentially revoking penalty rates is a massive wage cut for many already poorly paid workers. What they are paid is usually entirely spent within their local community/economy. The LNP claim that reducing penalty rates will allow a small business to employ more people is fallacious, as has already pointed out. The consequence of having your small number of employees paid less, is that they withdraw discretionary spending which would otherwise be supporting a local economy spread over a diverse range of businesses. The singular café owner who circulates his saved costs over a less diverse range (or saves it, as margins on many small enterprises are minimal) producing a smaller economic effect. Consequently, less money with a smaller circulation range results in a more recessed economy. Add now a nation wide multiplier effect. Penalty rate reductions do provide a boost to large company’s bottom line. Many of these corporate organisations – as we have recently become aware – channel profits overseas and pay no tax (or very little). and of course, large donations to the Liberal and Labor parties. The next Christmas present is the one the government has provided to the increasingly privatised Telstra organization. We have now been witness to the most absurd parody where the already over-costed but inferior speed internet NBN design choice has resulted in an $80 Million Christmas gift to Telstra. What for, you may ask? We are apparently paying Telstra to repair the copper network the NBN had already bought from Telstra in the first place for $11 billion. Apparently, the ageing copper wires need to be replaced, and this was announced on the Monday before Christmas. Merry Christmas Telstra, Turnbull disguised as Santa Claus, has delivered a significant parcel of money to fix the crappy copper network you sold to us in the first place. It is no wonder the government wanted to sneak that one quietly past us all. We have a history of chronic failure and escalating costs dogging the steps of the National Broadband Network from the days it began. Especially since the Liberal party changed the parameters under which our national network should work. This latest farcical payment is just another reason for the nation to shake their head in despair for us ever becoming competitive internationally with nations that are far in advance of where we are. Just as a refresher on the National Broadband Network which began with Howard in which the increasingly obsolete copper was reviewed for preference for a fibre network by a Senate committee in 2003. Despite several false starts it never really floated until Labor announced its intention to build it, as an election platform in 2007. Submissions abounded till 2009 when Labor proposed a Fiber to the Premises/House (FTTP/FTTH) solution. NBN Co was created in 2009, and both criticism and praise followed the complicated progress of its creation and funding. Labor’s FTTH (Fiber to the House) model provided for 100Mb/sec transfer rates and public surveys showed over 70% public popularity. 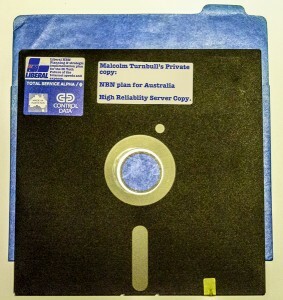 Malcolm Turnbull in opposition began advocating a Fibre to the Node (FTTN) model but took no account of how degraded the copper network and street hubs were to connect from nodes to home and workplaces despite being otherwise advised. The promise was 25Mb/sec by 2016. The Abbott government changed the strategy mid operation to an FTTN model in a politically motivated review. Nobody managed to keep any of their promises or claims and pricing rises, and technological obstructions multiplied. The result has been a short sighted waste of time that has squandered billions of dollars on obsolete technology that will leave our country lagging behind the developed world. (44th for Internet speeds in the world so far). Economic prosperity for any country can only be enhanced by the health and education of its participants. Undercutting both education and health can only ultimately be detrimental to economic growth and prosperity. Two days before Christmas, the Federal Health Minister, Sussan Ley, announced that 23 tests and procedures formally covered by Medicare would be dropped. Amongst these tests and procedures – which cost $6.8 million in 2015 – including ear, nose and throat surgery and diagnostic imaging. But who uses such tests you might ask? Whoever it was, that used these tests and surgery, accessed it over 52,000 times in 2015. 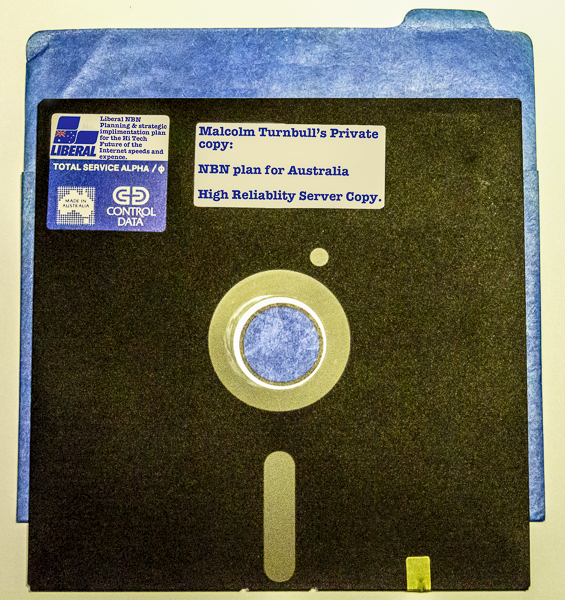 Therefore, Sussan Ley’s claim that these items removed, “was obsolete”, does not stack up statistically. The Australian Medical Association has, of course, been up in arms over the loss of these items from the Medicare benefits schedule. The financial cost to the community alone is not one that will contribute to the economic prosperity of our country. Even the Health Minister, Sussan Ley, admitted some patients “may be worse off”. The AMA has accused the government of restructuring health costs to families as a way of introducing a form of co-payment by stealth following repeated failures to convince the senate it was a “viable” idea. If you were one of the early Christmas shoppers, you might have noted Malcolm Turnbull’s latest budget was delivered in early December as the Christmas trees were appearing in our stores. 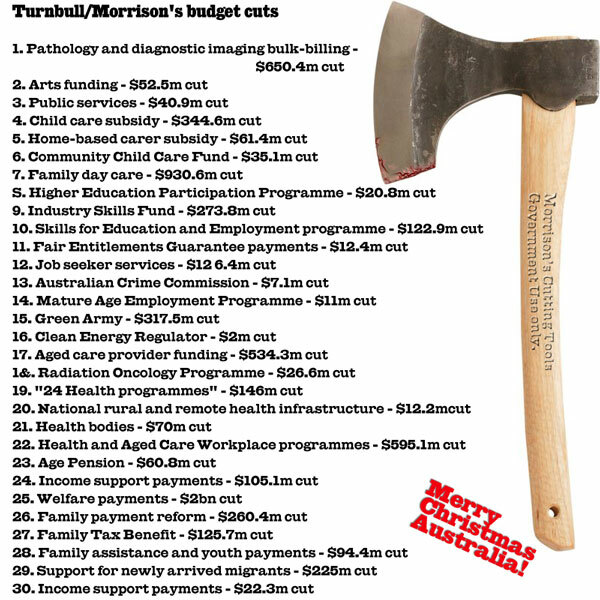 Malcolm’s early Christmas contributions included cuts to aged care, health bodies, aged pension, income support payments, welfare payments, family assistance/payment/tax benefit/day care, green environmental programs, numerous health programmes and a plethora of education and training programs. 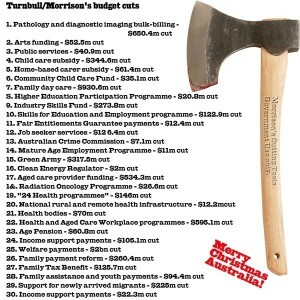 These and other cuts demonstrate the continued failure of the Liberal government to want to support the health and education of the Australian people. On the next subject of Education – already late in the Christmas season – members of the government are saying the Turnbull government will not fund the final two years of the Gonski school funding. Merry Christmas to our children!! All of these cuts were implemented to fund a $1 billion innovation package announcement, which was vaguely delivered without real detail. It seems vaguely reminiscent of a similar announcement was made by Kevin Rudd made in April of 2008 at the “Australia 2020 Summit convention”. The irony of that seems to have escaped the Liberal Party despite social media commenting on it incessantly. Most of this is not provided by way of direct funding but by way of tax cuts and exemptions. Other encouragements such as foreshortening bankruptcy periods will most certainly be exploited by unscrupulous individuals to avoid debt repayment and allowing them a faster return to business. Thereby repeating the process by fleecing another group of undiscerning victims. The large business concerns, will, of course, rebrand themselves as “innovators” to take advantage of even more lax tax laws resulting in providing even less contribution to the Australian economy. This is the Liberal Party’s version of the solar panel and insulation scheme. Failure to attend to detail is something of which both major parties are guilty. That said, it’s not hard to determine who will benefit from Turnbull’s package. and a number of stimulus programs which would support workforce participation in innovation. If your party is already undercutting education initiatives (with plans now submitted to the senate many times) to render the burden of education across the community in higher debt levels to participants, then from where does the appetite for innovation come? Certainly not from educated Australians who are burdened with debts. Indebtedness reduces people’s willingness to participate in “risk” that Turnbull is fond of suggesting we take. It also provides a sociological inhibitor to undertaking high-risk innovation, when a safe low-risk office job that will ensure financial capacity to repay debt is in the offering, although with our massive unemployment levels and relatively tiny job vacancies … perhaps not. Turnbull does correctly realise that Australia’s private sector industries are often too risk-averse to invest in the commercialisation of new technologies and innovations without massive government support. His $1 billion initiative is such a “support”. Historically brilliant Australian innovations are developed and exploited overseas. As a result, many innovative research and development workers find work and support away from Australia. As it is, Australia businesses frequently outsource technical jobs overseas and bypass local intellectual and creative industry workers for reasons usually related to cost of wages and recruitment. (as do the banks, communications and travel industries along with every small business person who gets their work done by cheap foreign labour). All of these practices undercut Australian innovation and development. The private sector enterprises unwilling to develop innovative ideas to a commercial level, preferring instead to survive by sponging off the taxpayer through subsidies and driving down wages and conditions of their employees. So who exactly is Turnbull hoping will engage in all this innovation by providing, even more, taxpayer funded “subsidies” or tax relief? Is this an approach that will work or backfire? Funding to organisations that have historically contributed to innovations in technology such as CSIRO has been savagely cut under this government. So one has to question just how much thought has been put into the practical applications of this idea. Now there is much talk about Turnbull providing an extra $100 million in funding to the CSIRO. This step is not dissimilar to the situation in regards his much-publicised increases to domestic violence funding of $100 million after Abbott had previously cut $300 million and overseen closures of numerous shelters. The situation here is remarkably similar. It turns out that Abbott cut $111 million in the May budget to CSIRO resulting in organisation wide staffing cuts. Twenty percent of CSIRO’s staff have already left. Suggesting that CSIRO now has sufficient funding to re-employ these experts is naïve. It overlooks the fact that science is a global labour market and the disengagement that comes from arbitrary retrenchment. Further, there has been a loss of momentum on resource & time critical projects that have been closed for months now. Very much like the D.V. situation where shelters had already closed and had not been reopened, CSIRO projects have similarly closed. Again a striking similarity of language used by the recipients of Domestic Violence and CSIRO funding where the term “first step to repair” was frequently used. Projects have already been irrevocably damaged by the loss of intellectual capital provided by long-term researchers. The damage has already been critical and funding a recovery will cost far more than was taken initially. It is also the case that the funding is tied to certain commercial provisions, so CSIRO is no longer free to return to its original directions even if they were able. If Turnbull is contributing less than that which was taken, it is simply insufficient to repair damage already incurred. The consequence is that real innovation from an organisation, which has historically delivered numerous technological breakthroughs, has already been lost. I believe this covers all the Christmas contributions that the Liberal Party have offered to Australia for 2015. Happy Christmas from the Liberal Party taking support from the elderly pensioners, penalty rates for low-income earners, Medicare rebates from the ill, education programs from students, tourism from tourists, sustainability from the environment, hope from refugees (or any ‘bloody’ foreigner), and research funding from scientists. Unlimited charity and generosity are extended to mining and big business interests, particularly those that fund their party – to the tune of million$.